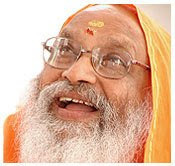 AIM (All India Movement) For Seva (which means service with a deep, heartfelt, caring attitude, with no expectations in return) is a movement spearheaded by His Holiness Swami Dayananda Saraswati in India. AIM For Seva touches the lives of over 2.5 million people in 1,000 rural and tribal villages across 15 states in India. This blog has been created to post important information on AIM For Seva activities in the Houston area (Texas, USA). Follow us on Twitter at "aim4sevausa"
AIM for Seva Home brings the best out of these students! This is an article published in "The Hindu"
BRIDGING THE GAP: Students at the Swami Dayananda AIM for Seva Students Home at Kadalur in Kancheepuram district. CHENNAI: At the sound of a shrill whistle 22 pairs of feet scamper to stand in four lines. With the short burst of the next whistle, the children lay flat on their backs. After what seemed like three seconds of relaxation, the next beep sees legs lifted off the ground forming a sharp L-shape. The legs stand poised in the air, waiting for the next call, which lets them relax again. “It is called Sarvangasan,” explains N. Bhupalan. At 6 a.m. everyday, this is one of the yogic exercises performed by children at the Swami Dayananda AIM for Seva Students’ Home in Kadalur village in Kancheepuram district. Bhupalan studies in the ninth standard in a school eight km away from the hostel. He goes there in a van with other children. Two years ago, his life was quite different. Bhupalan hails from a family of nine at Palaverkadu. His father is a fisherman. “I used to keep roaming and whenever we felt like, my friends and I used to run away to the seashore,” he recalls. When his mother found out about the hostel where facilities were provided free of cost, she decided to send him there. It is the routine and the discipline of the hostel that he likes the most. Bhupalan’s day starts at 5.30 a.m. and is filled with studies, play and school. Nutritious meals, three times a day, yoga and extra-curricular activities such as sports and music are a daily feature. It is a far cry from the life he was used to. Other children in the Home have similar stories to tell. They say that they would have dropped out of school and started working in the unorganised sector if they had not come to the Home. By setting up the Student Homes near schools, the organisation found a way. It was difficult convincing parents to send their children to the Homes at first, says Ms. Balaji. “They were concerned about safety.” Slowly and steadily, seeing the transformation in children, the parents were convinced. From basic hygiene to academics and value education, the children were provided a holistic education free of cost. Today, parents approach the organisation to enrol their wards. The aim of the organisation is to bridge the urban-rural divide, says Ms.Balaji, adding that they own the land on which the Homes are built. “There is a sense of permanence… We are here for the long haul,” she adds.